Hi guys! In this article, I decided to emphasize which is the real purpose of Calisthenics if practiced in different ways. As you can see from the title itself, maybe not all of you are aware or are considering which is the effective versatility of a discipline like Calisthenics. Now, given the above list, I will try to analyze one by one each point in order to provide you with an explanation of “why” these things are happening if you decide to go into Calisthenics. As you all are aware, Calisthenics is a way of training that implies to be able to use your own body weight and by means of it, let’s develop a capability to decide how you want your body built. In terms of putting on mass (muscle growth), there are of course many different ways to achieve such goal, but generally the simplest and most common one is the one where you create workout sessions aiming to the so called muscular hypertrophy. This means that, if you we wanna give a more specific definition of “hypertrophy”, it can be described as “the increase of size of an organ or tissue through the enlargement of the cells comprised in it”. Plasm: that simply represents the plasma as the gel-like substance contained in a cell together with other various things vital to the maintenance of life. So, whenever we talk about sarcoplasmic hypertrophy, we refer to the increase in the fluid’s volume contained in a muscle (i.e. the sarcoplasm). In this case, whenever we talk instead about myofibrillar hypertrophy, we refer to the increase in the size and number of myofibrils in muscle fibers allowing a consequent increase in the force generated by muscles’ contraction. Given the two types of hypertrophy above, now we must emphasize firstly fact that, since muscle fibers gain myofibrils, this leads to an expansion of the sarcoplasmic elements of muscle cells as well. A temporary increase in the sarcoplasmic volume can be reached by loading more creatine, eating carbs or damaging the muscle tissue. Progressive tension overload: given one of the most common bodybuilding techniques that can be applied also to a typical bodyweight training that aims to muscle growth, a progressive increase of tension overload can be one solution. It is in particular referred to increasing tension levels in muscle fibers. How?! Well, simply by increasing the weight you put on as additional to your own bodyweight; by including the use of a weighted vest, as well as kettlebells hanging between your legs, or discs, or whichever tool can be used and considered as an additional weight. Muscle damage: this can sound a bit weird as a solution to favorite muscle growth, but here is the thing; you need to look at this actual damage caused to muscle fibers, as a way to let the body be provided with proper nutrition and rest, so that next time it will adapt to better deal with what caused the damage in first place. Metabolic stress: also in this case, we are talking about a method commonly applied in bodybuilding, but that can be adapted also into bodyweight trainings, since the goal will be to increase the number of repetitions of each exercise until exhaustion. This is a situation that is likely to happen often when you firstly approach Calisthenics trainings and, since your body doesn’t recognize the main motor patterns, it is necessary to teach it by performing a fair amount of repetitions (between 10 and 15 each set) per each basic exercise such as Australian pull-ups, pull-ups, push-ups, dips and so on. Well, surely, I won’t go much in details in regards of this topic since there would be simply too much to say and too many ways to approach. Let’s just emphasize fact that, in order to get leaner, you will have to definitely cut short your way of eating and eliminate junk food as much as you can (if you were previously eating). Since you wanna take the best out of your workouts also in terms of getting leaner as well as in muscle growth, you will need to consider first thing first which type of body you have since we are all different and each organism/metabolism works in a complete different way. Then there is also to consider genetics, as that variable that can make many of you envy one another because maybe your friend is incredibly lean without having to do many efforts in terms of nutrition because genetically his body reacts in a way that keeps him all the time lean no matter what he eats (of course in certain amounts of food). Then you might wanna consider the age, the younger you are the better, since when it comes to changing completely your nutrition especially if coming from previos bad habits, if you are young you can apply such changes in a fair short amount of time compared to a person In his 30’s or more, where instead the approach has to be taken from a different perspective including the daily habits (work, family, kids and so on) and mainly the kind of training that could help the single subject to aim to drop down weight (in first place if needed) and then get leaner by following of course a proper nutrition as well as effective fat-loss, cardio workouts (HIIT, Tabata). So briefly we could say that there is no general formula that can work easily and fast for everybody; the way to get leaner requires you to be strong minded, constant and to do some more sacrifices in terms of nutrition and daily habits. A sure thing that has to be clear when you think of approaching disciplines like Calisthenics or Street Workout, where the main element is your own bodyweight, you wanna make sure firstly that if you are overweight or not in a physical condition that allows you to handle your bodyweight comfortably, while performing different exercises, well you should firstly focus on dropping down that weight and get lighter. In order to do so, one of the most effective ways to start the fat-loss process, is to fasten the heartbeats by working on cardio circuits that will help your metabolism to get in motion, to help to burn fat at the same time you are performing an exercise. 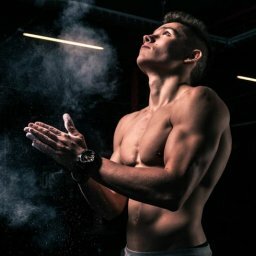 Now, if we think of combining the above fat-loss method with Calisthenics, that is far less dynamic in terms of working at a high heart rate, we could for instance think of merging the basic bodyweight exercises such as push-ups, burpees, jumping jacks (front, lateral), bodyweight squats, jump squats, alternated lunges and so on, we have already enough elements to work on in order to create an effective and enjoyable H.I.I.T circuit by using bodyweight exercises. “There is no specific formula to HIIT. Depending on one’s level of cardiovascular development, the moderate-level intensity can be as slow as walking.A common formula involves a 2:1 ratio of work to recovery periods, for example, 30–40 seconds of hard sprinting alternated with 15–20 seconds of jogging or walking. As you can see it seems to be a very useful workout that can be easily adapted to whichever kind of body condition you have and, based on that, build your own H.I.I.T routine to start burn fat. TABATA (protocol): this kind of training method comes represents one of the many protocols H.I.I.T. is made of. This one in particular, nowadays, seems to be one of the most accredited methods to burn calories fast with in a very short time lapse. Basically, this protocol is designed to raise the heart rate up in that very hard anaerobic phase for very short periods of time. As you can see, thanks to the short time lapse that you are supposed to work at the highest heart rate possible, followed then by a very short recovery time (10 secs), Tabata allows you to stimulate very positively both the aerobic as well as anaerobic system. In the second case, the anaerobic energy system helps instead when it comes to exercises that are targeting short and high intensity intervals. I decided to include also these two very important aspects of Calisthenics trainings, since I can assure you that, tested on my body, I notice an improvement in terms of flexibility as well as mobility. Now, the thing is that, you can’t misunderstand this concept by thinking that only by practicing Calisthenics regularly throughout the week, you will suddenly get more flexible and mobile. These two elements are the fundamental ones, that are helping the body not to get rigid at every tension is applied on it (straight arm exercises, isometric exercises), are helping to keep a clean form in the execution of each exercise, are helping to feel less sore after a more intense workout and most of all are helping to preserve ligaments, tendons and joints in a more advanced age (over 40 y.o.). To make a clear example of how these two components are helping, I wanna once again consider the situation that often occurs when it comes to perform exercises where, to have a clean form, you MUST be flexible and mobile. One of these exercises is represented by the famous L-sit hold, where in most of the cases, I am not able to see athletes performing it with straight legs, but always more or less bent once in full extension. Why is that?! Simple, like I previously said, Calisthenics is a discipline a bit similar to Breakdance and now you are wondering how is it even possible to compare such two different disciplines. Well the point is, in my opinion, that for such dynamic sports, where a lot comes in terms of using your body for movements that are not common in your daily habits or for movements that are implying you to build solid tendons and ligaments, you need to firstly think in terms of prevention. In both cases, either is Calisthenics or Breakdance, you MUST have a very flexible and mobile body, otherwise no matter how young you are, there will be aftermaths for not approaching the discipline by thinking in parallel to also develop or improve (in case you were already a bit flexible and mobile by nature) your levels of flexibility as well as mobility. So, once again, I highly recommend to pay attention to these two factors, since if you follow a proper schedule that leads you to a better overall body condition, you will find much easier to perform the different exercises rather than having to involve other muscles where it is not required; this indeed would happen when for a simple exercise such as pull-ups or even push-ups, people tend to bend their back, to use a kipping movement thanks to their legs and so on. Avoid all these unclean forms, take your time and patience and develop step by step the necessary strength, flexibility and mobility that are required to achieve the cleanest form you can in each exercise from the simplest to the most advanced ones. One thing I had chance to notice in past, especially at the gym, was the fact that whenever a guy coming from weightlifting/bodybuilding tried to perform a simple set of pull ups or even other kind of exercises like Dips, I always noticed a lack of form that lead that person to perform the exercise in unclean way. The very common mistake for instance is to cross the legs while performing push-ups, pull-ups and dips and have an arched back especially in the concentric phase of the movement. The point of this little bracket I opened, is to emphasize another important benefit of Calisthenics that is gaining incredible strength by learning how to control your body and use your own bodyweight to make exercises harder without necessarily adding weights (at least in a first phase of your journey). If we think, how much it is effective a session of Calisthenics even basic one, in terms of body control and so indirectly also of strength, the results are impressive. Well, keeping in mind the above points, try now to compare one simple rep of a pull-up performed in typical bodybuilding style (hence arched back, legs crossed, thumbs out, bent arms, chin over the bar) and of one rep performed instead like above. The results are quite evident and there is absolutely no comparison in terms of which form is the hardest one. This is why, by following a basic Calisthenics routine that involves simple movements such as pull-ups, push-ups, dips and core exercises both on the ground and on the bar, you can really aim to reach incredible levels of strength already at the beginning of your journey and thinking then to take it to another level once you are more experienced with them. Another factor that comes from performing a very good quality Calisthenics training is represented by the explosiveness you can gain. Explosiveness that can be seen whenever it comes to perform the very first Muscle Up or the very first waist-high pull-up or Handstand Clap Push Ups and I could go on for longer. These are all examples of explosiveness developed by working hard on the basics of each movement and then by increasing its difficulty by varying the way it is performed. 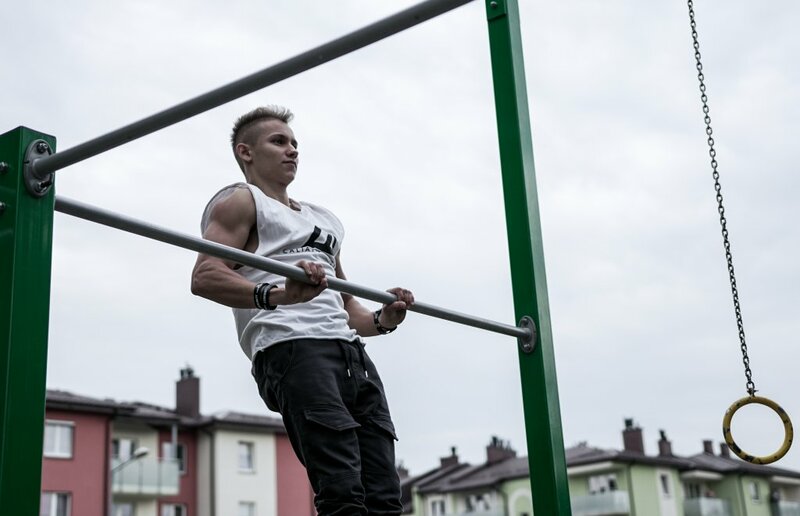 This means that to achieve the very first Muscle Up, we saw in one of the previous articles how this is possible by mastering firstly a group of exercises that are indeed helping to develop the necessary strength of course, but also the explosiveness required to take your chest over the bar and get into the dip as second phase of the Muscle up movement. Another example is represented by the waist-high pull-ups, in this case there is no specific formula to adopt in order to achieve such level of explosiveness since it is related to the capability of your elbows to go backwards by the time your triceps are so strong to push up your whole body over the bar at a waist-high. In this case as you can figure out, are required a very high level of pulling/pushing strength that can be developed in one way by working on weighted dips, weighted pull-ups and even weighted push-ups, but of course like I said this is just one way to achieve the goal since no specific formula can be adopted by each one of you. So to summarize, this brief bracket was just to emphasize fact that, by training with Calisthenics, not only you develop a strong, flexible and mobile body, but you also develop an incredible strength that then, thanks to more specific routines, can be taken to another level and make you more explosive and aim to even more difficult skills. Another element that can be considered to be developing while training with Calisthenics, is the body control. Now, there are many different situations in which is evident If you have a good level of body control or if it is still to be developed. The most evident case where you can see if a patient has body control, can be noticed when it comes to approaching a tool such as the gymnastic rings. A person who has been having the habit to perform dips on parallettes or on the bar without never testing himself with the gymnastic rings, will face some serious issues in the first times in terms of balance (hence body control). There is no better tool than the gymnastic rings in my opinion, to use to develop an excellent body control, involving all the muscles in your body and forcing you to focus mainly on the use of the stabilizer muscles (not used when performing exercises on the bar or on parallettes). When it comes to an exercise like the dips, when the body is placed on the parallettes, with shoulders depressed, arms straight, then the only thing left to do is starting the eccentric movement and even when starts the concentric one, no particular efforts are met in terms of balance. The same could be told if the dips are performed on the bar where, once again you just have to make sure that the shoulders are well depressed and elbows close to your hips for the whole duration of the movement. If we think instead about performing an exercise like the dips on the gymnastic rings, the story is completely different; first of all the support on which you are hanging is not as stable/firm as a bar or a pair of parallettes, then you firstly need to make sure that you have a solid support hold position. Without a solid support hold position you cannot even think to start working with the gymnastic rings since it is one of its fundamentals that allows you to gain body control. After mastering a solid support hold position, the other thing to consider is that also in this case, elbows are close to your hips for the whole duration of the eccentric/concentric phase, legs straight, hollow body position to keep spinal column in neutral and at the end, after the concentric phase, is finished return to the support hold position. The most common reflection of an attempt to perform a dip on a pair of gymnastic rings is the fact that a person who attempts to do so without a proper body control, won’t have balance at all and will start to tremble like a leaf. Of course, another example is represented by the push-ups on gymnastic rings that, at a first-pace, can seem to be pretty hostile movement to perform without a proper body control because once again, your shoulders/arms will be placed on an unstable surface (the rings) hence also in this case you need to make sure to have solid support hold form (scapula protracted, hollow body position). Another form of expression of body control in Calisthenics is surely represented by the Handstand and all its variations such as Handstand to tuck planche (and all its progressions), Handstand push-ups, One arm Handstand, Handstand on parallettes/on rings and so on. As you can see there are so many different ways the body control is constantly challenged when it comes to Calisthenics trainings that it is for sure another element to develop, to improve and to always keep clean. ALWAYS TRAIN AS IF IT WAS THE LAST WORKOUT OF YOUR LIFE!